(Text automatically translated) The House of Olives is located within a private complex very quiet, just a few steps walk from the sea. From the living room, as well as from the garden and terrace you can admire an enchanting rising and setting of the sun behind the village of Brucoli. The House of Olives is an excellent starting point for countless excursions (short and long). Brucoli, a typical fishing village, just a few minutes walk, here and in other neighboring countries you can taste the delicious Sicilian specialties: granita, arancini, sweets with almonds and pistachios, ... and countless fish specialties. Several other locations are easy to reach in about half an hour you will be in Catania, Baroque town with its typical fish market, and its wonderful old town, rich and charming, very lively even at night, in less than an hour you will be Taormina, the pearl of Sicilian tourism. Always in an hour you can climb Mount Etna, the largest active volcano in Europe, with the possibility of unique and exciting excursions on foot and by cable car, only twenty minutes away, there is the fascinating Syracuse, ancient Greek city, with its wonderful artistic and cultural heritage, to say nothing of Noto, about 30 minutes, and with its ceramics of Caltagirone, a little more than an hour ... Obviously it is essential to the car! 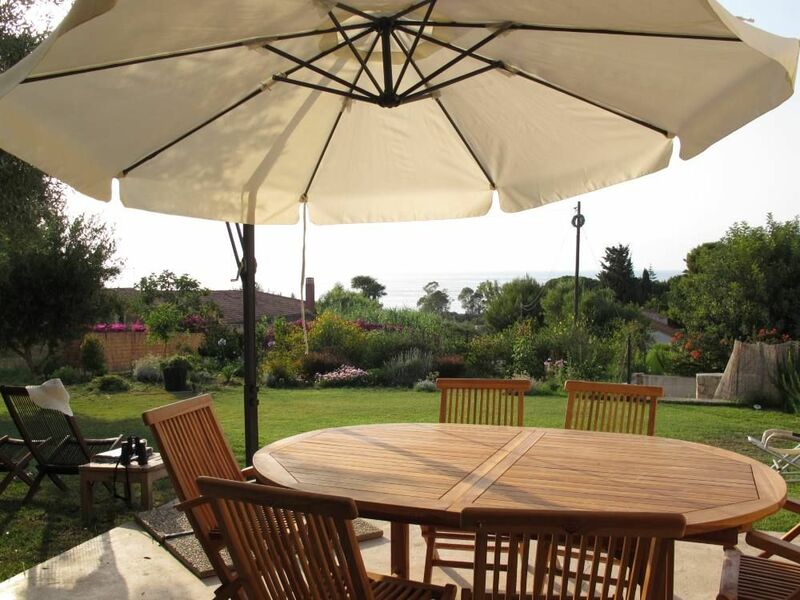 The house is in a lovely situation with a lovely garden looking over the bay to Catania. In good weather it must be idyllic to sit in the garden or on the terrace looking at Mount Etna. Unfortunately the weather was very poor (but not cold) during our stay and we weren't able to take advantage of the house's main attractions (we couldn't see the volcano). We were very unlucky but this was not the fault of the house. We were 5 people and were very comfortable inside but because of the weather we could not spend much time in the garden or on the terrace. I think if there were more than 6 in the house the living accommodation would be crowded, and self-catering would be difficult. Brucoli is convenient for Catania and its airport, Taormina, Siracusa and Noto and we visited all these places, sometimes in heavy rain! Giuseppina was very helpful and when we had a couple of problems she fixed them very quickly. We were quite late in the season and some of the restaurants in Brucoli were not open, but we did have some delicious meals. One of our party is allergic to fish and seafood, and sometimes it was difficult to find an alternative in the restaurants (only salad for dinner!). I think if the weather had been good I would have given four stars - when you travel from a cool wet country for a holiday in a hot dry country, you expect to live mainly outdoors. If you can't do that, you give more attention to the indoor facilities and don't appreciate so much the outdoors. Bei gutem Wetter sieht man den Ätna wirklich so schön wie auf den Bildern. Die Terasse und die Dachterasse sind großartig.Wir waren Ende September bis Anfang Oktober dort. Das Haus liegt in einer gepflegten Anlage. Es gibt eine schöne Badestelle (Felsen), wirklich nur ein paar Schritte vom Haus.Für 9 Personen ist alles vorhanden (große Töpfe, genug Teller und Besteck).Das Dorf Brucoli ist in weniger als einer halben Stunde zu Fuß zu erreichen und sehr angnehm für einen Spaziergang. Es gibt einen kleinen Supermarkt, Bäcker, Fleischer, Fischläden, Cafés, Bars und Restaurants und auch im Oktober war noch nicht alles geschlossen.Catania (Flughafen) und Ausflugsziele wie Ätna, Siracusa, Noto, Villla Augusta sind gut mit dem Auto zu erreichen. Die Vermieter sind sehr freundlich und unkompliziert.Das einzige, was gefehlt hat, war eine regendichte Überdachung der Terasse. Da wir im Oktober da waren, gab es natürlich an dem ein oder anderen Tag auch Regen. Schön wäre es gewesen, wenn man trotzdem hätte draußen sitzen können. Laut Beschreibung war alles vorhanden, Vermieter waren sehr freundlich. Merci Fabienne, c'était un plaisir de vous accueillir.